This competition is open to entries from 12th May until 11pm, 25th May 2017. This competition is open to residents of the Republic of Ireland and Northern Ireland only. 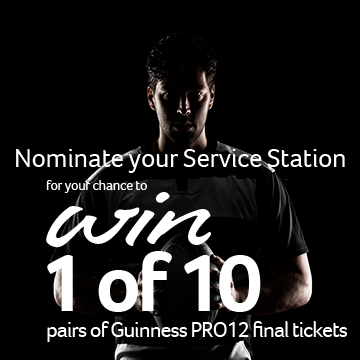 The prize is a pair of tickets to the Guinness PRO12 Final at the Aviva Stadium on 27th May 2017. Employees of The Maxol Group, and their families or other persons connected with this promotion are not eligible to enter. Tickets must be collected from the stated Maxol Service Station. Entrants below 18 years of age will be disqualified. The 10 winners will be announced by name on the Maxol Facebook page on Friday 26th May. By entering this competition you consent to the sharing of your name publicly on the Maxol Facebook page if you are chosen as a winner.